Well, this is probably the most beautiful hotel I have ever stayed in, in one of the most beautiful countries I have ever visited.. 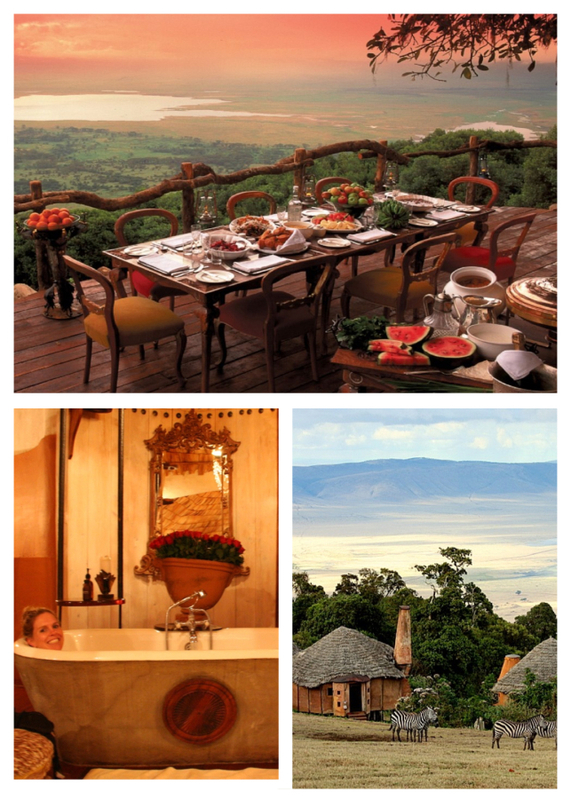 This is definitely Honeymoon material..Tjeesss what an amazing location.. Basically, this lodge looks out over the Ngorongoro Crater where there is an enormous concentration of wild animals. The views are absolutely breathtakingly beautiful. The lodge exists of different huts that are superbly chic. You have your own fireplace with two armchairs and home made chocolate and sweets and brandy to enjoy as a gift from the hotel. A bath on feet (if you see what I mean) All women love that… An enormous bed, bathroom, a balcony with views over the insanely beautiful crater (we had bad luck and very bad weather). It’s like having your own little 1 bed flat. When you would like to have dinner in their main building where they have a beautiful lounge and restaurant, you need to call someone to pick you up from your hut. Basically, it is not safe to walk alone outside your hut as there can be lions, hyena’s and so on. We had some buffalo’s with yellow eyes staring at us when we left the hut..Woohoo exciting! The guy from the hotel that picks you up is dressed in traditional Masai clothes with a spear and all.. Quite beautiful and cool. Hi, you should definitely add The Oyster Bay Hotel, Dar es Salaam to this page. We stayed there last week and it is without doubt the best hotel experience we have ever, ever had. Beautiful design, personal service, amazing food….I could go on!